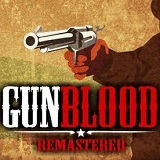 In game Gunblood Remastered you should participate in duels on revolvers. At the player of only 6 cartridges, therefore it is necessary to shoot quickly and neatly. There is one rule – it is impossible to begin shooting readout is not finished yet.